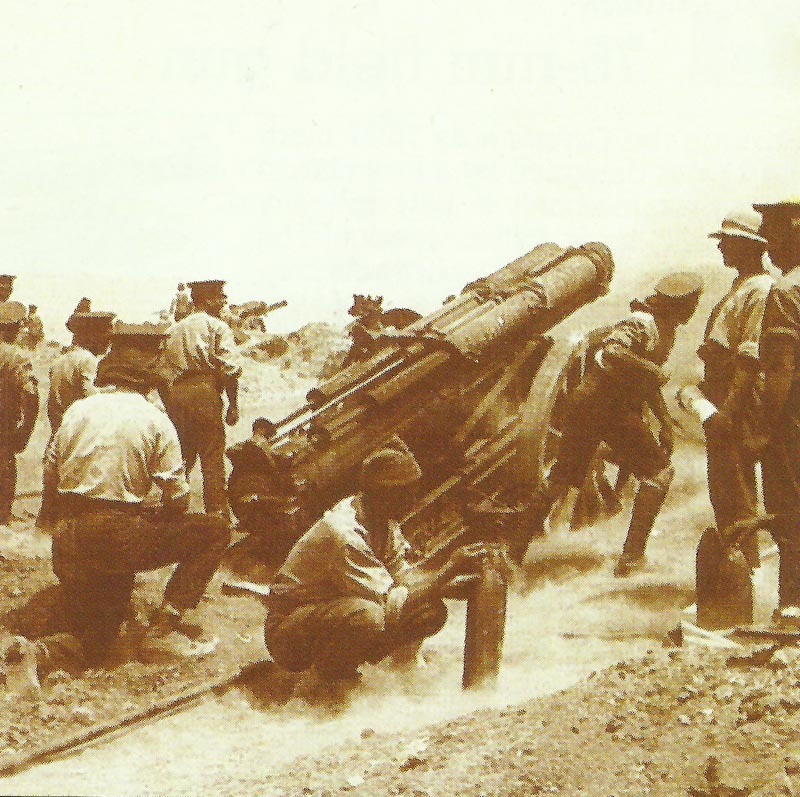 A British 60-pounder heavy field gun in action on Gallipoli. Gallipoli: Hamilton’s Suvla landings dispatch; storm damages Anzac and Suvla piers, more damage on October 27-31. India­: Minister and Viceroy consider asking for 2 Japanese divisions for Mesopotamia. Northwest Frontier: ­3rd Action at Hafiz Kor; British maul 9,000 Mohmands, armoured cars first used. Operations end on October 28. Loos: BEF First Army repulse 4-divisions German counter­-attack, battle officially ends, British capture trench near Cite St Eloi. French setback near Double Crassier (Loos). Champagne: Unsuccessful German attack on Navarin Farm-Butte de Tahure. Galicia: Brusilov takes 1,000 PoWs at Novo Alexinatz on border. Serbia: Serb counter-attacks broken up by superior artillery as Mackensen builds up bridgeheads. East Africa: CIGS (Chief of British Imperial General Staff) memo for Kitchener recommends 1 brigade ­and 10,000 reinforcements. France: German airship LZ74 bombs rail targets. Returning to Darmstadt in dense fog she strikes a summit in the Eifel and is crippled. Anglo-French Munitions Agreement. Chantilly Conference fixes Salonika Army at 150,000 soldiers. Bulgaria­: War Minister General Jekov named C-in-C.